I am about to share details on new portaledge design (the D4 Portaledge) via a crowd funder, and felt it was most appropriate to reveal one of the new features here on Supertopo first, as Supertopo has always been lively with interesting thinking! My new D4 ledge has four major innovations, and I am quite confident the design will become the new paradigm of portaledges in the years to come, as it is stronger, lighter (around 6kg with haulsack and fly), more rigid, easier-to-deploy and pack up, and packs smaller. These are all things I believe are essential for remote lightweight alpine big walls, as well as making an El Cap ascent more fun. First, a bit of history. In 1986 I started designing portaledges after getting rescued on Half Dome with the then state-of-the-art portaledge design, the frames collapsed and the flys shredded in the wind, and we almost died of exposure. I moved to Arizona (warmer climes! ), and after a bit of engineering analysis, decided to use 1 1/8" 6061-T6 tubing with 0.058" wall thickness for my new design. All other portaledges--mostly homemade ones back then, along with the Gramicci and Fish--used 1" tubing or smaller. Part of the reason I chose the 1 1/8" 6061-T6 aluminium (1.125" Outside Diameter, 0.058" Wall thickness) is I was also getting into hang-gliding at the time, and while learning to fly, bent a few triangle control frames on bad landings and had to replace them. The 1 1/8" 0.058" wall 6061-T6 aluminium tube is the exact same stuff used for the hang-gliding down tubes, so I had a supply. Next, using my engineering skills learned in Uni, I completed a iterative analysis to determine (for a given assumed load of two people in a worst case loading situation) what the largest rectangular frame that could be built with 1.125"OD 0.058"Wall tubing. This resulted in what is now known as the "A5 Alpine Double", which was 43" wide by 75" long (this is the exact model made by Runout Customs today). The A5 Double was the first commercially available two-person portaledge (note: Gramicci had made some double ledges a few years before, but only a very few were made and they were never offered publicly for sale). We made the first prototype for Mugs Stump (who coined the term 'Shark Fins') and after he came back from a climb in Alaska with it, we began full scale production (interesting note--we had actually made a three-person ledge before we ever made a two-person one, a custom ledge for Mike Hoover for an Antarctic trip). The first A5 double ledges had a lot of new features which evolved over the years and have become the standard for modern portaledges, such as the angled Shark Fin dividers, the bed tensioners, the block corners, cam-buckle suspension, the single-seam fly, and a bunch of other stuff you see on most ledges today. John might use big words like "asbestos" and "marmalade", but his D4 ledge is a whole new paradigm in ledge design. You guys won't believe it .... It's THAT good! Can't wait to see it, I still have two Gramicci ledges that someone gave me for a free many years ago. The original fly makes it hard to sleep with the stench and you worry about it collapsing with a strong wind gust. I should probably upgrade . 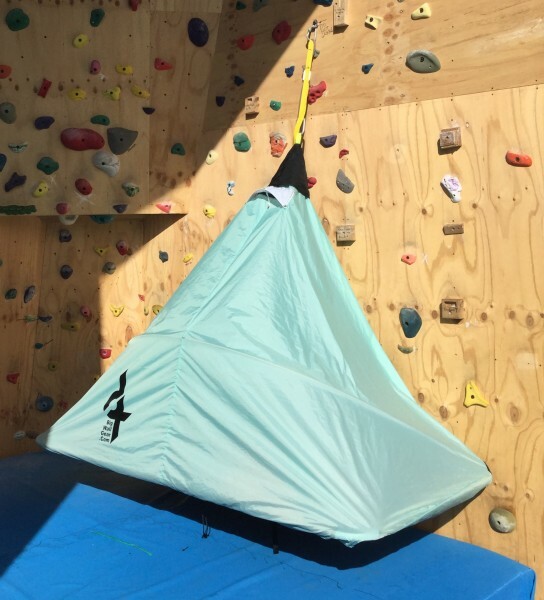 . .
Around 1993, three-person big wall teams in the remote ranges were coming in vogue, so I designed the Cliff Cabana, which originally only came with the Diamond Fly, and was first used on the first ascent of Escudo (more info here: http://www.bigwalls.net/climb/Escudo.html ). Now, in terms of frame, of course it had to be significantly stronger for three people, but we also had a lot of infrastructure in the 1 1/8" block corners, so I still used the 1.125" OD tubing but simply beefed up the thickness to 0.083", and that seemed adequate for the limited market of this specialised, three person ledge (very large top platform--51" wide and 86" long--so three people can sit and cook, but a place for the third person to sleep in the hammock below--the fly also can be anchored from below and is streamlined for the intense updrafts that are experienced on the big stones). 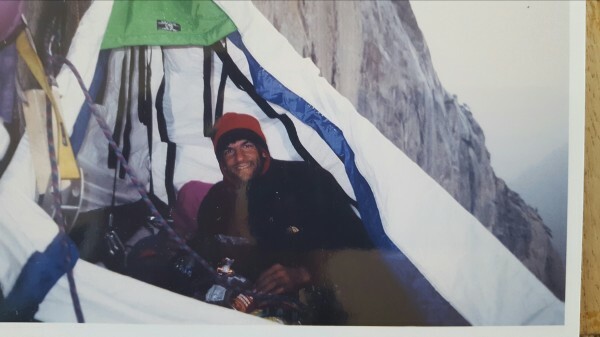 The 1990's saw a huge boom in standards in remote big wall climbs, nearly every expedition to the Karakoram, Himalaya, Patagonia, Baffin Island, Central Aisa, Africa, and many other places where big faces were getting climbed for the first time were using the A5 ledges, mostly the A5 Alpine Double size. We made both a regular drape-over fly and also developed the expedition fly which was completely enclosed and had a floor and two doors--the expedition fly was for those specialised situations where every BTU was essential for survival. 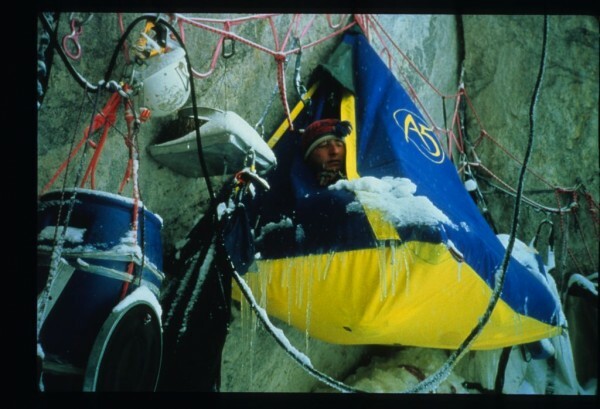 On Great Trango in 1992, we spent three nights battling a severe storm at 19,500' with the original drape-over type fly on an Alpine Double ledge, and we survived, but I would have liked to have something a bit more secure, especially in those severe winds, thus the impetus for the expedition stormfly design. always liked this photo by Eric Brand--Jared O. in one of the first A5 Expedition Stormflys on the first ascent of the North Face of Nameless in 1995--the biggest baddest full north-facing Karakoram big wall! Supertopo has always been lively with interesting thinking! Looking forward to seeing the new ledge design. I remember all those 90s A5 innovations from when I lived in Flagstaff. I really have never been much of a wall climber but I still have one of those A5 visors from that era. I think Tim or Barry made it for me. ^^^ you mean one of these? Yeah Duece! I'm in the market for a ledge now to.. Hope they're inexpensive. In 1998 I sold my company and worked in California long hours (mostly very early mornings to mid-afternoons, as a morning person) for 18 months to ensure the production of the ledges within a larger corporation (this was a challenge), as well as developing a number of new products, including a new breathable fly material using PTFE (performed better and was 1/3 the price of the major brand), and the first completely waterproof backpacks and haulbags with welded seams. Then I moved back to Flagstaff to become a Grand Canyon River guide and to pursue other interests in architecture and tension fabric design. River guiding is dreamy, and I got a bit out of shape going with gravity instead of against it (plus the food on commercial trips is amazing). Another development of course was the Metolius ledge (45" x 84", 20.5 lbs with haulsack and fly), which again was modelled after the A5 Alpine Double (during a climbing trip to Smith Rock, Tim Maloney, who worked at A5 in those days, reported seeing a dismantled A5 ledge in their shop a year or so before their ledge came out). It has the same major features: block corners, shark fins, single seam fly, bed tensioners,etc.) They did come up with one nice innovation, though, the top metal clip-in point, which, though adding weight, lessens the need to manually seam seal the top clip-in, and probably provides long-term assurance of the strength of the clip point. Simply yes, yes and yes. Theres an unfinished project and this could be one of the keys. Bring it on. Lighter than a Fish Double? Nice, congrats and good on you for getting at it again John. You always made top shelf stuff, looking forward to this and more. I've been wondering when ledges would get a real update. I feel most ledges in the last 10 years have almost been a downgrade. I have a hard time using the BD option just because it is so heavy! 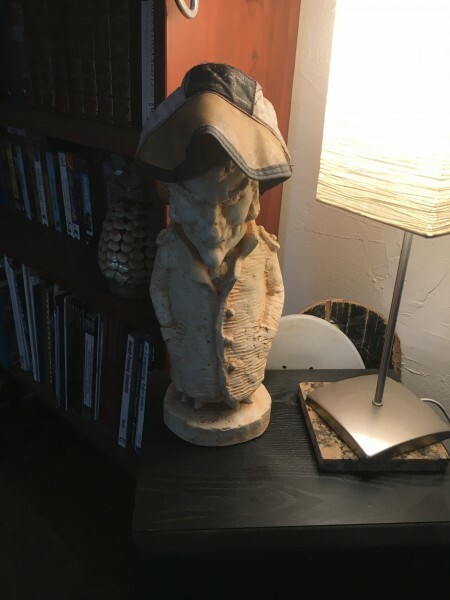 Took two of those things down to Venezuela a few years back and was ready to just leave them there after the trip! I still miss the original A5 double with expedition fly. Pretty much perfect for 90% of all big walls. 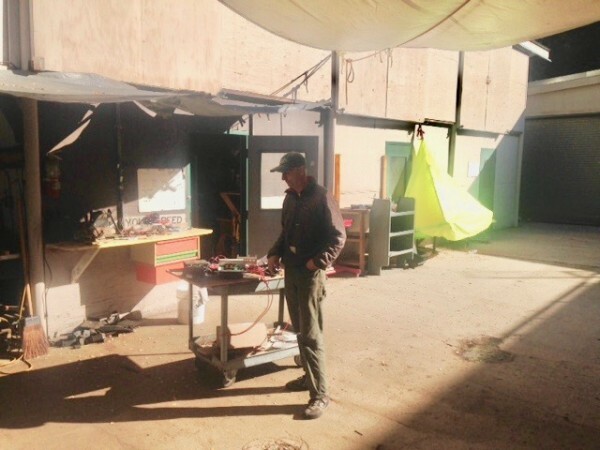 John Middendorf showed me his new portaledge prototype and did some last needed modifications when he was here in Yosemite last fall. He was really excited and I hope it becomes a successful product especially on the weight side of it. Biggest drawbacks to the ledges are weight and ease of setup especially the bed when a big storm is on top of you. Good luck John and was so great to see you again. It was more than just "modifications", Werner! That time working with you last fall in your workspace is one of my funnest and proudest moments of creative hacking ever (not to mention getting to hang with you and Merry after so many years--my first visit to Yosemite this century!). I came to the Valley with nothing but a frame of my new design--I hadn't been able to get the bed and fly done in time for the trip. Somehow I procured a broken abandoned portaledge, and one of my old flys from 1990 that had been in the Zion museum for many years, and some other bits of straps and webbing from various climbers in El Cap Meadow, the new nearly full time hang for all the cool climbers (thanks, Tom Evans!). The bed didn't fit my frame, so bustling around the valley with you to borrow tools like a decent tube cutter from all the Yosemite infrastructure sheds was an adventure in itself! That sewing machine the horse packers use is a classic! After three of four days, though, the first very rough prototype ledge was coming together. At that point I really had no idea if my design was going to work, but once a had a proto, I could see that all my hard work designing various structural dimensions and concepts, that this new design was really going to be a breakthrough. I was hoping to test it on El Cap, but I didn't really have all the gear for a wall (guys like Robbie and even Alex Honnold in the meadow one day offered to lend me any gear I needed! ), but I was mostly nervous about going up in late October with that old fly of mine--over 25 years old--and I suppose I was hesitant to depend on a ledge fly I hadn't made myself (but more likely was just experiencing pre-wall jitters, haven't climbed a wall in 15 years, and want to be more prepared when I do--perhaps this year!). But I did test my new design at the base of Sheep Ranch, hanging from the first A3 move (plus a rivet) where I bivied one night, and realized I was on to something. Future SuperTopo climbing news email entry for sure! The teasing is killing me. Cruel. Looking forward to ordering one. I know the start of the Ranch well. In 2004 on Day One I busted my ankle when I hit the ledge falling off. Bimollalular fracture. Free plates and screws. In Canada. Thanks for updating us on your exciting project, Midds. Best wishes for success.